Submitted by Joshua Heward on 15 January 2017. Sunday is an official day off for support staff in McMurdo. Helicopter operations stop on Sunday so we knew we wouldn't be flying today. We decided to hike to F6 camp and then walk to Many Glaciers Pond to sample the P3 experiment. Normally this would have been a helicopter ride but our schedule is so tight we can't afford another day without getting any field work done. 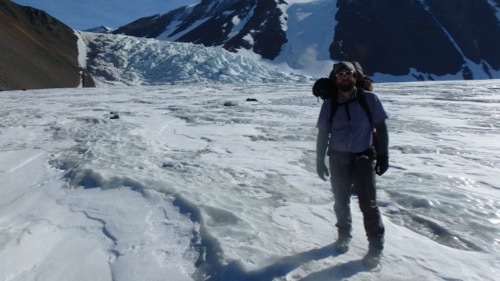 Backpacking and hiking are my favorite things to do so I was pretty excited about a backpacking trip in Antarctica. Our packs were stuffed with all of our ECW gear and sampling supplies. We planned to raid the survival cache at F6 camp for sleeping bags but in a worst case scenario you can just sleep in your ECW gear. Josh Heward, Byron Adams, Andy Thompson, Jeb Barrett and Matt Hedin at Lake Hoare Camp are all packed and ready for a hike to F6 Camp. Photo by Michael Gooseff. We followed the trail from Lake Hoare up the western side of the Canada Glacier then across the glacier below the ice falls. We used strap-on stabilizers on our feet for traction on the glacier. The ice falls are the point where the glacier passes through the narrowest section of the mountain so it moves faster and the surface is all broken up. The way the light interacts with the broken surface of snow and ice is captivating. It is like a campfire, you find yourself just staring at it, unable to look away for very long. Josh Heward stands in front of the ice falls on Canada Glacier. Photo by Andy Thompson. This was my first hike across a glacier and it was awesome. The air was noticeably colder on top of the glacier and I was glad we had a relatively warm sunny day for our trek. After crossing the glacier we headed down the mountain slope on the eastern side of the glacier to Lake Fryxell. Like most of the dry valley lakes, Fryxell is frozen over with only a narrow moat of exposed water around the edges. Andy Thompson and Matt Hedin stand near the Canada Stream. 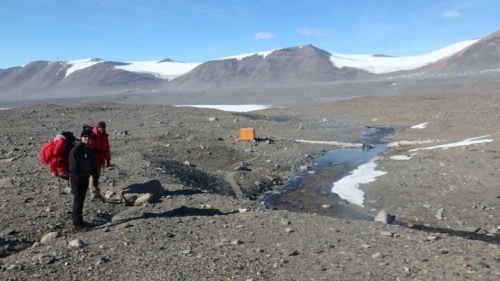 The stream flow sampling station is visible in the background. A small portion of the frozen Lake Fryxell is visible in the distance. Fryxell Camp is on the north side of the lake and that is where we stopped for a late lunch. The lake level has risen so much in recent years that they have had to move the camp farther away from the shoreline. 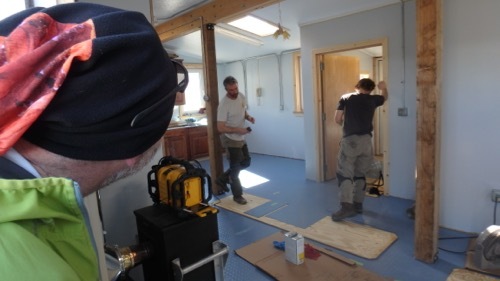 There was a carpentry crew installing the floor in the new Fryxell hut when we arrived. Byron Adams talks with the carpenters installing the floor at the new Fryxell hut. From Fryxell camp we ferried across the moat in a boat attached to a pulley system. 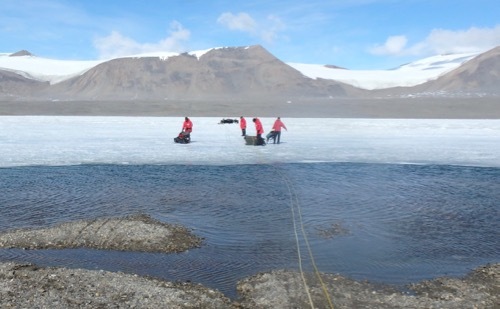 We used two ATVs that were parked on the ice to drive across the lake to F6 camp on the other side. The ice was relatively smooth near the moat but it was extremely rough towards the middle of the lake. A bone jarring ride towards the middle quickly forced us back out to the smoother ice near the moat. We took the long way to F6 camp following the shore line. This small boat attached to ropes and a pulley system is used to ferry people and equipment across the moat to the lake ice. 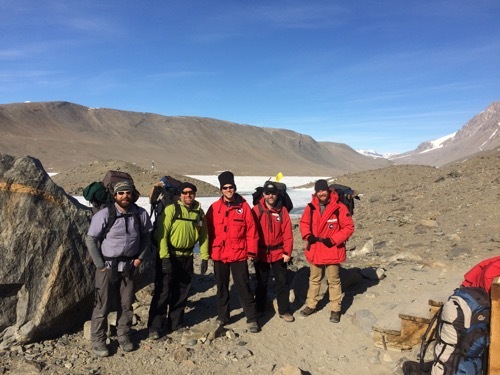 When we finally arrived at F6 camp we unloaded some of our gear, refilled our water bottles and had a quick snack before heading out to Many Glaciers Pond to collect samples at the P3 site. Sampling took about two hours and we arrived back at camp a little bit after 9:00 pm. Andy made pizza (chili-dog pizza) while the rest of us sorted samples and organized camp. The pizza was delicious! (The long day of hiking might have been the most important seasoning.) It was a long day but that is very typical of working in Antarctica. There is lots of work to be done and only a short window of time to do it. It was also a lot of fun trekking across a portion of Taylor Valley. If all goes well Andy and I will be taking the samples back to McMurdo tomorrow. We loved reading about your adventures tonight. It has been a great experience for Ruth and Lottie to see what you're up to and learn more about our beautiful planet. We hope to catch your webcast next week at their schools. Thanks Kari, I am glad you are enjoying it.